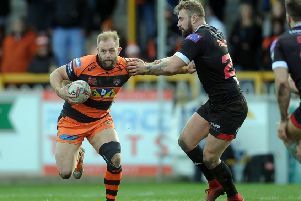 Castleford Tigers stretched their winning run to nine matches against Wakefield Trinity when they toughed it out to win a hard fought game 11-6 in the pouring rain at the Mobile Rocket Stadium. In atrocious conditions it could never be a free flowing classic and both sides only managed a try each in an attritional battle decided by the boot of Luke Gale, who landed three goals and a drop-goal. Play far too slow at times with referee James Child littering the game with 19 penalties, but there was some outstanding defence from both sides and some surprisingly decent handling from both despite the weather..
Cas adapted to the conditions in the first half as they reigned in their flair a little and put in plenty of short kicks. They forced three drop-outs, the first of which came on five minutes from Luke Gale’s grubber that surprise full-back choice Jake Trueman almost reached. Paul McShane’s kick forced another drop-out form the next set when it was followed up by some good tackling that forced home full-back Scott Grix back over his own line. Wakefield’s first attack almost brought them a score as Anthony England attempted to barge over near the line only to knock-on, video referee Phil Bentham deciding no try. But the Tigers did open the scoring in the 16th minute when Mike McMeeken crashed onto a short pass by Ben Roberts to go over for a try that was converted by Gale. The hosts looked to hit back, but a great tackle by James Clare forced Ben Jones-Bishop into touch to foil a dangerous attack. Clare was seen in attack two minutes later after more Tigers pressure off the back of a Gale forced drop-out. However, the winger put a foot in touch as he looked to squeeze over the line after taking a fine pass from Michael Shenton. Wakefield enjoyed a spell of pressure themselves towards the end of the half with Kyle Wood and Grix kicks defended by Trueman at the expense of goal-line drop-outs. Another decision went to the video referee as David Fifita attempted to charge over the line, but the official correctly decided that the Trinity forward knocked on and there was no ball strip by McMeeken. Cas stretched their lead by a point four minutes before the end of the half as Gale landed a drop-goal and it was 7-0 at the break. Trinity had the better of the play at the start of the second half as Reece Lyne was tackled just short on a sixth tackle play and Keegan Hirst was held up over the line. Another threatening attack ended when Pauli Pauli threw the ball into touch a few yards from the line. Wakefield finally put some points on the board in the 59th minute with a piece of magic from ex-Tigers half-back Liam Finn whose long kick into space was perfectly judged for winger Ben Jones-Bishop who outpaced Clare to get to the ball first over the line. Finn added a conversion from wide out and it was 7-6 and all to play for. Cas responded and when Grix fumbled a Gale high kick and Tom Johnstone caught it in front of him the offside was spotted by referee Child. The resulting penalty was kicked by Gale to nudge the Tigers three points in front. Another Gale penalty seven minutes from time made it 11-6, but an exciting finish was to follow as the restart was fumbled by Greg Minikin, giving Trinity possession within 10 metres of the visitors’ line. Heroic defending from Cas kept them out, however, with the closest Wakefield coming to a try being when Johnstone lost the ball close to the line. Scorers - Wakefield: Try Jones-Bishop; goal Finn. Castleford: Try McMeeken; goals Gale 3; drop-goal Gale. Castleford Tigers: Trueman; Minikin, Webster, Shenton, Clare; Roberts, Gale; Cook, McShane, Millington, Holmes, McMeeken, Milner. Subs: Ellis, Moors, Foster, Springer.